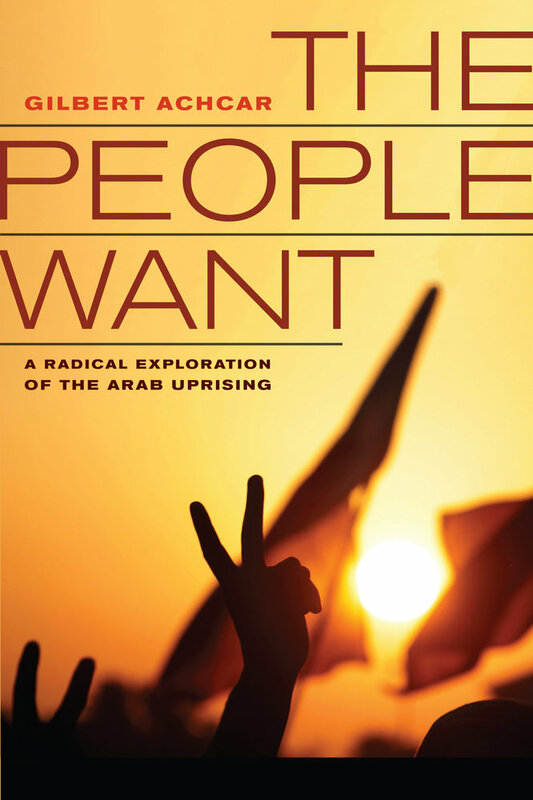 “The people want . . .”: This first half of slogans chanted by millions of Arab protesters since 2011 revealed a long-repressed craving for democracy. But huge social and economic problems were also laid bare by the protestors’ demands. Simplistic interpretations of the uprising that has been shaking the Arab world since a young street vendor set himself on fire in Central Tunisia, on 17 December 2010, seek to portray it as purely political, or explain it by culture, age, religion, if not conspiracy theories. Instead, Gilbert Achcar locates the deep roots of the upheaval in the specific economic features that hamper the region’s development and lead to dramatic social consequences, including massive youth unemployment. Intertwined with despotism, nepotism, and corruption, these features, produced an explosive situation that was aggravated by post-9/11 U.S. policies. The sponsoring of the Muslim Brotherhood by the Emirate of Qatar and its influential satellite channel, Al Jazeera, contributed to shaping the prelude to the uprising. But the explosion’s deep roots, asserts Achcar, mean that what happened until now is but the beginning of a revolutionary process likely to extend for many more years to come. The author identifies the actors and dynamics of the revolutionary process: the role of various social and political movements, the emergence of young actors making intensive use of new information and communication technologies, and the nature of power elites and existing state apparatuses that determine different conditions for regime overthrow in each case. Drawing a balance-sheet of the uprising in the countries that have been most affected by it until now, i.e. Tunisia, Egypt, Yemen, Bahrain, Libya and Syria, Achcar sheds special light on the nature and role of the movements that use Islam as a political banner. He scrutinizes attempts at co-opting the uprising by these movements and by the oil monarchies that sponsor them, as well as by the protector of these same monarchies: the U.S. government. Underlining the limitations of the “Islamic Tsunami” that some have used as a pretext to denigrate the whole uprising, Gilbert Achcar points to the requirements for a lasting solution to the social crisis and the contours of a progressive political alternative. Gilbert Achcar is Professor at the School of Oriental and African Studies (SOAS, University of London). He grew up in Lebanon. His books include The Clash of Barbarisms, translated into thirteen languages; Perilous Power: The Middle East and U.S. Foreign Policy, co-authored with Noam Chomsky; and the critically acclaimed The Arabs and the Holocaust. Gilbert Achcar, author of The People Want, gives a lecture on the past and future of the Arab Uprising at the DU Center for Middle East Studies.